LENGTH X WIDTH X HEIGHT: 193 x 75 x 54 in. CARGO CAPACITY: 13 cu. 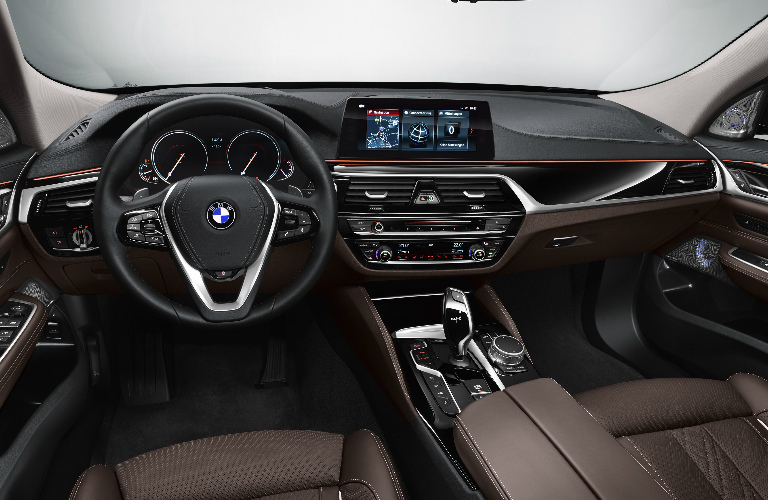 ft.
BOTTOM LINE: The 640i GT is a typical large BMW, quiet running luxury with exceptional power. The 2018 BMW 640i GT (there is no 2019 version) shows that BMW is as capable as any manufacturer in producing dual-personality vehicles. First of all it’s a 6 Series, making it one of BMW’s larger sedans. The “GT” appellation shows there’s a little bit more power under the hood. And since it contains typical BMW luxury, the 640i is comfortable for long trips. But it has its quirks. Interior styling consists of tan leather seating surfaces that contrasted nicely with the black dash and trim. Instrumentation is clear with multiple warnings. It went crazy when I was in the automatic car wash and the wands were traveling around the car, probably too close for comfort. Quirk 1: The audio system shuts off, or not, when you exit the car. Most cars automatically shut the audio off when the driver’s door opens. Not this one. It does eventually shut off, though. As a large sedan, and being in the age demographic I am, I enjoy the fact that the 640i is a comfortable driver/rider. On the highway, or on local roads, it is smooth. Yet, when you want the power, it is there. Hit the loud pedal and you get a comfortable push in the back as the turbo kicks in. Some smaller cars get all crazy when the turbo engages, wanting to wander all over the road with the new-found power. Not the 640i, which is more genteel. Handling is excellent for a large car, aided by the M Sport Dynamic Handling Package that adds integral active steering, adaptive drive, active roll stabilization and dynamic danger control. There are times when you can be lumbering along peacefully and suddenly the road bends. The car realizes this faster than you do and you can enjoy the twists and turns. There is good visibility all around for the driver and passengers. Parking is aided by Park Assist, that gives front, rear and side views when you’re trying to negotiate. Quirk 2: To keep your eyes on the road, there is a heads up display (HUD). However, I couldn’t find any way to adjust the display, and therefore all I could read (comfortably) was the local speed limit. The sound system and HVAC are excellent. We drove the 640i in some single digit temperatures and the car warmed up quickly. Also, the heated wheel turns back on automatically the next time you enter the car. As a luxury feature there is a large sun roof that extends all the way back to the rear seats. Quirk 3: The key fob is about the same size as a small cell phone. While it’s hard to lose, it does take up a large portion of your pocket and there’s no way to hook it to a key ring. Interior storage consists of a modest console under clamshell armrests. Inside are USB and 12-volt outlets. There is wireless charging ahead of the two cup holders at the base of the center stack. Rear legroom is excellent. Rear seats are heated. For powering accessories there is a pair of 12-volt outlets at the rear of the center console. I think these may have originally been lighters. In addition, the rear seat backs fold easily to create a flat larger cargo floor. As do the fronts, the rear seat backs also recline slightly. Further back, there is a power trunk lid opener with a kick function. Wiggle your foot around under the bumper and the trunk lid automatically opens. 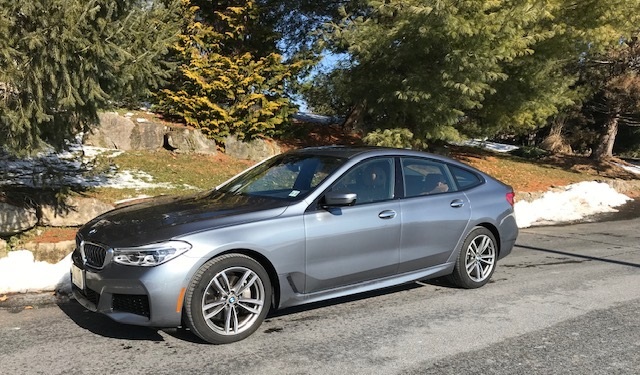 There’s a lot to like about the BMW 640i GT. There is some sticker shock, but there’s also a lot of car for the money. The Most In-Depth Independent BMW Research - Anywhere!